the red kitchen: KATIE LEWIS: Author of "I Am Awesome At Making Everything"
KATIE LEWIS: Author of "I Am Awesome At Making Everything"
So, recently I was asked to write a short biography. About yours truly. This, by the way, is AWKWARD. Maybe if I was one of those really annoying people who love to brag about themselves it would be easier. But, unfortunately, I'm this really humble person who's too busy giving her time to serve squirrels and bunnies to think of all the reasons I'm great. Anyway, I suffered through it anyway and wrote one. Or four. After nine years (and several gold medals) in Olympic figure skating, KATIE LEWIS settled down with her husband and daughter to enjoy the simple life. Approximately one month ago, she learned how to sew and her book I Am Awesome At Making Everything is already at the top of the New York Times Bestseller list. She currently lives in Africa where she is perfecting the art of South African cuisine. KATIE LEWIS is a great lover of all things cat. Her feline friend, Fuzzball, is the inspiration for her latest line of fabric, appropriately named "My Pwechious Fuzzy Fuzzball." Her other lines, "Cats Cats Cats," "My Kitty's So Pretty," and "If I Were A Cat I Would Be A Fat Cat" have been top-selling at fabric stores nationwide. She currently lives in Wilmington, North Carolina with her husband, daughter, and 63 cats. 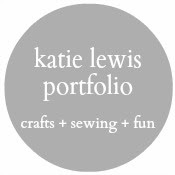 Most know KATIE LEWIS from her starring roles in every single movie ever made, but what her fans don't know is that she is also an avid seamstress. Not only has she made every piece of clothing in the entire world, she has also hand-sewn enough quilts to wrap around the world and give it a big hug--twice. She currently lives in the White House where she works as the President of the United States of America. KATIE LEWIS was born into the world with no arms, legs, or head. She defied all odds when she not only lived, but became an avid crafter and seamstress. Her novel, "Look, Ma! No Head!" climbed to the top of the charts in record time. She currently lives in New York City where she works as the creator and editor in chief of the magazine, "Katie Lewis Living." So... which one do you think I should go with? For extra credit, please write a better biography (about me, obvi) and leave it in the comments. My personal favorite is the 4th one. It might help to read some author bios of books/authors that you really, actually like. Writing a bio like this is always awkward...I used to think that they were written by some admiring editor at the publishing house. It wasn't until I took my Idea to Book class that I learned that the authors themselves write their own bios AND the blurb on the back of the book. Duh. Who else would know the book (and the author) so well? But yeah, they're hard to write. Good job with the funny ones...hope that loosed up your creative juices! After being born and raised in the Northwest, Katie found the love of her life and has frequented her sewing machine ever since. She also considers her husband and daughter to be kinda important, too. She's lived in many places since then, but her sewing machine always accompanies. She currently serves happiness and writes in RedKitchenLand, North Dakota. 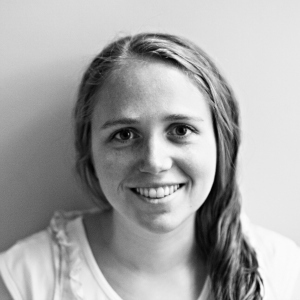 Katie Lewis grew up in the Pacific Northwest before attending Brigham Young University where she graduated in Home and Family Living. When Katie is not reading Elephant and Piggie books or playing at the park with her daughter Olivia, you will find her sewing away on her faithful Bernina sewing machine or blogging at The Red Kitchen while her husband Bryan occasionally reads her interesting anecdotes from the optometry text he is studying. Haha! Excellent, Polly! And mostly all true! Although I sew on a Janome and Bryan doesn't read me things from his textbooks so much as he just spouts them off from memory. Yeah, I just made up stuff for the things I didn't know for sure. You could always start with your "I'm going to introduce my family to the new Ward" section of the talk the Bishop always asks you to give while you are still unpacking all the chaos we call home. Other than that, my recommendation is for you to get O or Brian to write it for you. Ooh, good idea. I'll have Olivia get right on it. Wow, you think you know someone. But in my defense, living overseas means I rarely follow american politics, so it's easy to forget who's President. Also thank you for making these shorts, they fit perfectly and they're my favorite color!